Family: Scales round to elliptical, thin. Genus: Test round or oval in cross-section; pseudostome terminal with dentate scales. 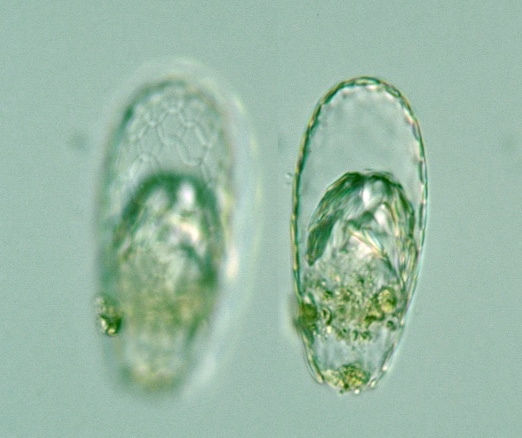 Species: Test elongate-oviform with hemispherical crown, not compressed, 45-100 μm long, 24-50 μm wide; pseudostome circular, 10-20 μm diam. ; body scales circular to broadly oval in shape, 8-12 in each row, 10-16 μm long (Cash & Herbert, 1915). Scales more than 10 μm in diam. Scales 8-10 μm in diam. Scales 6-8 μm in diam. s. 6 μm φ ? Scales less than 6 μm in diam.